Many patients experience episodic shoulder pain, meaning that they may experience symptoms for a time, which then resolves, only to resurface in the near (or distant) future. This ends up being a very frustrating and disheartening to patients, who may have been suffering from this pain on and off for long periods of time. While we, as clinicians, definitely want to acknowledge the role the brain plays in pain  and address this with appropriate patient education, we also want to take a look at the musculoskeletal causes for non-specific or episodic shoulder pain. These patients will likely present to your clinic with a referral from their PCP with something along the lines of “Shoulder Pain” or “Shoulder Impingement” (very specific, I know). The first thing we want to look at with these patients is to assess the balance between all the muscles in the shoulder. The reason being is that muscle balances between against and antagonist muscle groups can cause sheer forces in joints, which can create stress on cartilage, ligaments, tendons, capsule, and degeneration or deterioration . All of this will limit rehabilitation and the overall outcomes that the patient will experience. Now, knowing all this, what exercises should clinicians prescribe to their patients to complete as part of their home exercise programs (HEP) to aid in the healing process? Enter, what I have been referring to as “The Core-4 Exercises for Shoulder Pain” . All of these exercises should be completed for 6-8 weeks, every other day with between 10-30 repetitions of each exercise. At minimum, 1 set of 10 reps of each exercise should be completed. The maximum number of repetitions should be 30 reps, 3 sets, completed every other day. Resistance could be simply against gravity at first, then adding resistance as tolerated. At first, try limiting any movement to shoulder height, with thumbs pointed up. External rotation against resistance, in the plane of scaption is completed in order to strengthen the commonly weak external rotators. 1) Start with your elbow flexed to 90 degrees, with your elbow slightly abducted (away from) your body, grasping a resistive band. 2) Slowly rotate your hand and wrist away from your body until you can not go any farther. Make sure your elbow remains in the same position (not tucking it close to your side, or allowing it to raise up like a chicken wing). 3) Slowly return your hand/wrist to its original position. Repeat at least 10 times. 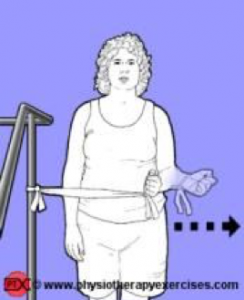 1) Start with your arm at your side, grasping a resistive band. 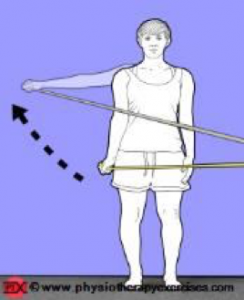 2) Slowly lift your arm out and to the side, like you are going to do a jumping-jack, keeping your thumb pointed up (this minimizes the risk of impingement while completing this exercise). Raise the arm to shoulder height. 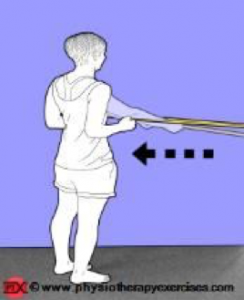 3) Slowly return your arm to its original position. Repeat at least 10 times. Scapular Retraction or “Rowing” is completed to strengthen the external rotators and scapular stabilizers, which are two commonly weak muscle groups. 1) Start with your arms at your side, grasping a resistive band in each hand. 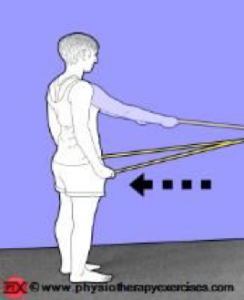 2) Slowly pull back with both of your arms with your elbows bent, like you are rowing. Try to pinch your shoulder blades together and hold for a slow count of 3-5 seconds. 3) Slowly return your arms to their original position. Repeat at least 10 times. Strengthening shoulder extension is important to strengthening the Latissimus Dorsi, a commonly weak muscle, and to counteract the rotator cuff reflex mechanism . 2) Slowly pull back with both of your arms with your arms straight. Try to pinch your shoulder blades together and hold for a slow count of 3-5 seconds. 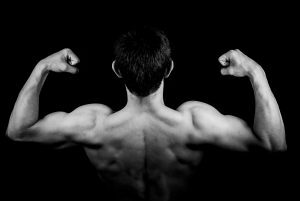 These exercises help to strengthen the 4 most common muscle imbalances that can cause shoulder pain or impingement. You can get a free downloadable version to hand out to patients here. You can find more clinical resources, patient educational material, and materials to improve your clinical reasoning & decision making on our resources page. Kooijman MK, Swinkels ICS, Leemrijse CJ, de Bakker DH, Veenhof C. National Information Service of Allied Health Care. 2011. Page P. SHOULDER MUSCLE IMBALANCE AND SUBACROMIAL IMPINGEMENT SYNDROME IN OVERHEAD ATHLETES. International Journal of Sports Physical Therapy. 2011;6(1):51-58. Oestmann, Eric. Rotator Cuff Disorders. Summit Professional Education Seminar Manual 1226. 2014. Bachasson D, Singh A, Shah S, Lane JG, Ward SR. The Role of the Peripheral and Central Nervous Systems in Rotator Cuff Disease. Journal of shoulder and elbow surgery / American Shoulder and Elbow Surgeons . [et al]. 2015;24(8):1322-1335. doi:10.1016/j.jse.2015.04.004. www.physiotherapyexercises.com for the use of exercise images.